A colleague of mine, Beth Mynatt, recently spoke at the World Economic Forum. She came back with many ideas, including introducing me to the idea of giganomics. Giganomics is economics for a time in employment when people are far more likely to have a series of “gigs” than become the “organization man”, someone who has a single job for life. The idea of giganomics caused me to reflect once again on the immigration system we have in the United States, and the one we might want. Employment-based visas (I am deliberately excluding family-based and marriage-based here) are controlled. The purpose of the control is to ensure that the labor market remains favourable for citizens and permanent residents, while simultaneously creating advantages for the country by being able to capitalize on foreign talent. This seems very reasonable in the abstract. Employment-based visas typically come with three forms of controls today: employer, time and caps. Most visas tie their holder to a particular corporation, exclusively. In the age of giganomics I wonder whether this is the most effective way to control a visa. For one thing, it puts large employers with their full-time immigration staff, their financial resources, etc… in far better positions than it does small to medium size corporations such as start ups. My H1-B worked this way, and when I left Lucent and moved to Xerox, the six months I spent in the United Kingdom was waiting for my H1-B to be transferred from one organization to another. We can, and I certainly did, blame the INS for slow processing times. Perhaps we should also inspect this notion of employer controls. Are there some visas for whom being tied to an employer is not the advantage that we want to create in the American labor market? Who would those people be? Would the University play a role in identifying them? The second set of controls involve periods of time. After this period of time is up, immigrants have either moved on to another visa or its time to leave. The H1-B is a good example, it is valid for a total of six years, but those six years are broken down by three years, two years, and then a final one year. I’m wondering whether this periodicity is helpful? It means that the default is that the INS process the same person three times in the course of six years. It maybe the case that its considered desirable to keep a close eye on the employee or have the ability to say that their skills are no longer required (and deny the visa), but employers can do this too by simply terminating the employee thus rendering their visa invalid, at least for those visas that have some relationship between being employed and visa validity. What if the periodicity was one six year visa, or two three year visas. Consider the amount of time and money saved by the individual, the employer, and the Government. Caps (i.e., number available in a particular year) do get discussed, there are caps on the H1-B visa. Are there two few or two many, the cap routinely changes in response to employer requests. This fluctuation and the dialog between corporate America and the Federal Government, is that a good model for implementing this control? I don’t know but I think it’s worth asking, and it is reflective of more of a conversation between constituents, unlike my own feeling of being in a system that really never thought to communicate with me. Anyway, on the day when the caps for visas are reset, Oct 1, the start of the Federal Government’s fiscal year, I want to put another shout in for a conversation about immigration that doesn’t begin and end with policing illegals, but also includes a discussion about what we, the American people, actually want for our country, what we want in terms of a system that encourages the best of foreign talent while preserving advantage in the labor market for citizens, and how we might control it while also considering the costs to individuals, employers and the government for executing on those controls. I found this article very interesting, it reports a changing trend in the types of people emigrating to the United States. I am one of these new types of immigrant of course, and I know many others (many of whom are now, like me, choosing to become citizens). So, I was interested in this report because of its personal nature for me. But I am also a University Professor, in a time when discussions about the future of the University are also on-going. And this report suggests that our college graduates are competing against these immigrants for jobs. At least that’s the side presented by this article. The other side is one that business frequently represents, particularly visible each time there is discussion about reducing the caps for H1-B visas is that they need qualified labor more than the U.S. currently produces. And in Computer Science there have been declining rates of enrollment (although perhaps that’s beginning to change). Seems like there are lots of factors that need some serious discussion if we are to get to the bottom of what is actually going on. And I wish that the media (and many politicians) would spend more time reporting and discussing these factors rather than get the public wound up about illegal immigration. Not just because I think it’s frequently done in ways that are largely scare tactics rather than substantive discussion, but also now because I wonder whether we’re focused on the wrong “problem” as a result. Knowing more about these trends in immigration might be one part of rethinking the system so that it works for everyone, both those in it (timeliness, transparency, and fairness) and those affected by it. But I expect we’ll continue to be motivated by the specter of an immigration problem that prevents us from finding out what’s really happening because that’s what our politicians can get themselves into the media talking about. And we are in an election season. Generally, I tell people that I’ve been employed by three institutions since graduating. Bell Labs, Xerox PARC, and now Georgia Tech. But there’s a fourth place I spent five months. Xerox EuroPARC in Cambridge, the United Kingdom. I describe it on my vita as a Visiting Researcher. I was a visting researcher, visiting England and EuroPARC because the INS was transfering my H1-B visa from one company to another. When I left Bell Labs, I wanted to start work at Xerox PARC, but the INS had other ideas about that. Specifically, the dual-intent H1-B visa is employer specific. So, in addition to the caps on the visa, the fact that it’s one of the few that’s dual-intent, it is also tied to a particular employer and a switch requires reprocessing. Perhaps this made sense when employment was more traditionally for life, but that’s not the typical case today. Unfortunately, the modern world is not the one that the INS promotes for its foreign workforce. There is no nimble or agile move, one that might be of benefit to the new employer (presumably since the candidate has been through a rigorous interview including demonstrating that they are more qualified for the job than any available American in order to qualify for the visa in the first place). Instead, it is time to enter a period of processing ambiguity. For the future employee that is a period of unpaid exile (since the person can not be employed by the new employer). There is no grace period (well not one long enough) in which one can remain in the United States while the processing occurs. So, the lucky “customer” wins a trip home with no specified end-date. And I was lucky, very lucky indeed. I was lucky that there was a possibility for me to continue in my research career in a place where I was legally able to work, the United Kingdom. I was even luckier that there was a group of talented individuals whom I got to know through the course of this visit. I also got lucky that the UK was seeing very rapid adoption of SMS among teenagers and I was able to study this. I was also lucky that I had a support system in the United States. I left the country, but I was still receiving a variety of mail. Since it was my intention to come back, I did not want to re-route all this paperwork to England. I needed an address where the material could go. I also was required by Bell Labs to perform a roll-over of some of my accrued retirement, one that was nearly impossible to do from outside the country (favourite advice “just call this 1-800 number”, only possible from inside the U.S.). I needed help to manage these matters while I was in exile.. Thank you to both my support systems. The one in the U.S. who held down the fort. And the one in the U.K. who developed my career in an exciting new direction. The opportunities and interactions I had in Cambridge have lasted far longer than the time I spent there. I was very lucky. And so this is probably the last of these posts. I’ve called attention to what I think the problems are of our current immigration system for the people that it serves. In this post I also want to highlight the problems that the current immigration system poses for employers, the backbone of America’s economic vitality and continued success. This system has failed them as well as me. In 1991 I was offered a Fulbright Scholarship that would cover a portion of my Ph.D. It was an attractive offer. At the time I was choosing between two institutions, UC Irvine and a British University. I wanted to go to Irvine, but to do so I needed funding. The Fulbright was some of that funding, and I was very tempted. But ultimately, I declined it, (and before I received the scholarship that would let me attend UC Irvine). Because it came with an Intent to Return clause (also have heard it described as the “go home clause” and more formally it’s known as the foreign or home residency requirement) on my visa. The Intent to Return is a condition that requires the visa holder to return to their country of origin and reside there for two years post completion of their studies before they may re-enter the United States. Not all visas come with this stipulation, but I was told that it was very common for people who received Fulbright scholarships to end up with this Intent to Return attached to their visa. I didn’t like that idea. I wasn’t sure I knew what I wanted to do post-Ph.D., but I was pretty sure I didn’t want conditions attached to my decision. And I was incredibly lucky that I had choices. I could decline the Fulbright, because I had another option in the U.K. Ultimately I received a no stipulations fellowship from the U.K. that would allow me to go to Irvine and support me for most of the way through the program. I can understand one rationale for the Go Home clause, it’s the idea that people can receive education in the U.S. and take the results of that and apply it back in their country of origin. At the same time I think there is a risk and a challenge in asking that. The risk is that if we discover really talented people while they are in the course of their program that we lose them. The challenge we ask of anyone who accepts these terms is that they know how their lives will be in 5-6 years. I know I couldn’t have made a good prediction about my life at the age of many people who enter the PhD program, in my early 20s. Intent is an interesting term in the U.S. immigration system. Broadly there are two categories of intent. Intent to not stay (the Go Home clause is a very particular instance of this), but many visas mean that their holder is only here temporarily, and Intent to Stay (the Greencard is a good example of this). Have you ever wondered why the H1-B is such an important visa? Why do so many immigrants want an H1-B visa ?Why is it so popular that the caps for these visas run out each year, long before the end of the year and all the people who need one have one? What creates the demand? The H1-B visa is one of the few visas that has “dual intent.” It’s a visa which you can apply for while on a student “intent to return” visa and one that while holding it you can apply for an “intent to stay” visa. You can’t apply for a greencard immediately after having a student visa if you are a worker, you have to apply for the H1-B visa, and you have to be on that visa before you can apply for the greencard. Now what makes this particularly curious is that when you apply for the greencard as a worker, you go through a variety of work-related tests. You are tested to ensure that your job meets certain labor standards. You are assessed on your qualifications as to whether you, above all others, should hold it and for its relevance to the United States. So, if the greencard is an examination of work-related abilities, why can’t you when you finish school and start employment immediately transfer from one to the other? I’ve never understood the work that the H1-B is doing other than generating a lot of additional processing for the immigration authorities. I spent 6 years on an H1-B visa. I did not want to do so, but I had no choice, I had to apply post-PhD for the H1-B in order to be eligible to apply for the greencard. 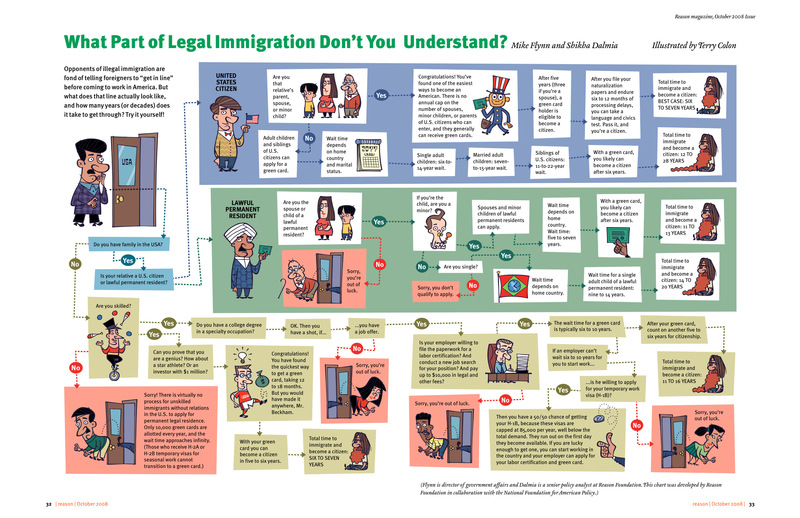 In a series of posts I’ve had asking questions about the US immigration system, I ask two today. First, what risks do we incur when we ask people to “go home?” Second, what work is the H1-B doing if there are processes for a work-based greencard that test someones abilities (as well as their health, criminal record, etc…) that make delaying the vetting for permanent residence and the use of the H1-B desirable? Secondary Inspection is the second round of immigration that is typically reserved for people who have immigration “issues” when they arrive in the United States. For example, the first time I went to secondary inspection I queued behind a lady from some part of the world where having a visa issued by the U.S. State Department was essential for travel into the United States. Unfortunately, she did not have said visa, so here she was in that part of the U.S. that is the secondary inspection area. What, you ask, was I doing there? Well there’s a category of immigration that comes with automatic secondary inspection. I submitted my Permanent Resident (a.k.a. greencard) materials shortly after transferring from Bell Labs to Xerox PARC. At the time I filed for the greencard, I had also filed for and been given the final extension possible on my H1-B (you can only hold an H1-B visa for a total of six years). I had two years to get the application for my Greencard approved. Surely it couldn’t take longer than that. Two years later my H1-B ended and my greencard had not been processed. I entered a new phase of maintaining legal status in the country. Now I would, until my greencard was processed, apply, each year, for two documents.One to allow me to legally work in the U.S. and one that allowed me to travel in and out of the country for business. Each is a separate document, process and fee. It was during this period that I applied for the interim work authority, while my greencard application was in progress, but because the system could not process either application in tim, I also had to apply for an emergency interim work authority. Three filings, processes, and fees to maintain my legal status in the country. It was the travel documents that triggered secondary inspection with each return into the U.S. I found the visible sending to Secondary Inspection, quite embarrassing, since you have to do it in front of all the other people in the immigration area. Hopefully you can imagine being sent to a backroom unlike most other people… I wondered whether they thought I was trying to somehow abuse or go around the system, I was actually trying to do everything to the letter of the law. Secondary inspection, for me, was like participating in Mastermind (made harder by having just gotten off a 8-10 hour flight). I was taken to a small interview room and asked a series of questions about my time in the United States. By this point I had well over a decade of experience. I was apologetic that I could not remember the first date I’d ever arrived in the United States, I explained that I was 7 and that I was a B-2 dependent visa holder and that Jimmy Carter was the serving President and that I’d entered the U.S. through JFK. I could remember the date and place of my second entry (Los Angeles, 19th Sept, 1991 about 9pm), but I had trouble remembering whether it was the 5th or 6th entry into the country that was my first entry through Chicago’s O’Hare. After about 15-20 minutes of this, I was allowed to enter the U.S. Each time I travelled in, I travelled on a document issued by the INS that they trusted so little that they wanted to check me out at this level of detail. And so I continued to wait, until the shredding news story came to my attention. Apparently the California Service Center had discovered a new means of reducing backlogs by shredding applications. Of course, my application was pending at the California Service Center. So, a new question crossed my mind, had my materials been shredded (I only got the answer to this when I went for my naturalization interview, it took two officers to carry my materials into the interview room! My lawyer told me she’d never seen a file so thick, a rare moment of immigration pride for me). It was at this point that I decided I needed the help of my citizen husband. We wrote, three times each, to our local Representative, Nancy Pelosi, and to each of our Senators, Dianne Feinstein and Barbara Boxer. I learnt that each of them had at least one member of staff devoted exclusively to immigration matters. Additionally, members of Congress and their staff have a separate line to the INS, one where people answered! My in person visit with one of the staff members was particularly well timed since her office happened to be working on another British immigration case, apparently a member of a very high profile British rock band was having trouble getting the visa he needed to enter the United States for his upcoming tour. The staffer was happy to put in a call about both of our cases together. Something magical happened shortly after I came to the attention of my members of Congress (it took three letters to each, hand delivered the second and third times), which was that my application got processed and approved. I wonder whether multiple offices had asked the INS about the same case, and maybe the agents decided that instead of putting it back into the pile of to process, they ought to process it. My greencard was a 4 year wait, punctuated by yearly applications, multiple fingerprintings, and ultimately enough frustration to trigger engaging the U.S. political and representative system to see whether I could get help. I offer this as another point of reflection on whether we could do and want something better. Last week, I became an American citizen. I’ve been asked why, and it’s because I wanted a voice. But the final delay belongs to the Georgia Driving License facility and the Motor Voter Act. Motor Voter was designed to get more people registered to vote by making registration possible when applying for a driving license. I went to the Georgia DL with my British passport and my permanent resident card. When asked if I wanted to register to vote I said no, because I know that I can not vote. I was registered despite showing this documentation and despite verbally saying no. During the application for citizenship I learnt that registering to vote as a non-citizen was a crime carrying the sentence of deportation. What had happened? During my application for a driving license, I never saw or signed a voter registration card. The only thing I signed was my electronic signature and that I was instructed to give because it was required for the license itself. It was then reused without my consent on my voter registration card. When I renewed my license, I was asked again if I wanted to register and I ticked no. Luckily I kept a copy of that form, lucky because my lawyer used that copy to make a case that when I am asked if I want to register to vote I say no. Fortunately, the INS had issued a memo saying that now it was up to the interviewing officer to assess whether the person had sufficient “good moral character” despite being registered to vote, partially based (so I understand) on the mistakes that could occur via Motor Voter. So I hired a lawyer, another $3000, and had him make my case. Unfortunately, despite passing all the tests in the interview, the officer who interviewed me could not decide she needed her supervisor to make that call (this apparently is true in 95% of all these Motor Voter registration cases). And so I disappeared into a void that immigrants know too well, the one that consists of absolutely no transparency into the process and no knowledge of when or how it would end. I was left to wonder whether I would be considered good enough or taking a one way ticket out. Months later (I’m lucky, some people wait over a year) I got my answer. They allowed me to become an American. So, here is the voice that I said I wanted. I do not support illegal immigration, but I also do not support the current process of legal immigration in this country. It lacks transparency, particularly for it’s “customers.” It can be humiliating. I did not tell very many people I was applying for citizenship because of the embarrassment I felt over the potential threat of deportation. It’s stressful. For those months of waiting, I wondered what would happen to my life as I knew it. And I wish it was the first time the INS had put me in that situation. Being a legal immigrant costs a fortune. One I can pay. That emergency interim application because the two others couldn’t be processed, yes, that’s *three* applications for the same thing each of which cost me and my employer money. We blame those who avoid the system (perhaps we ought to give equally vocal blame to those who hire them avoiding the same system), but I think we ought to take a good look at the system itself and ask whether we think its working. I shall be doing that with my American voice. I’ll be doing it, because this immigration system is doing it in my name, their policies and procedures are mine, done in my name and on my behalf. Recently, I’ve written about how much I dislike a) not being able to participate in the U.S.’s democratic processes b) how insulting I find American public/media discourse about political issues, because it assumes we’re stupid and like everything reduced to its simplest and most extreme form and c) the lack of healthcare. In other words, I’ve told you what I don’t like. But there is much to like. And today, I’m in a meeting. There are 17 researchers present. I am the only woman. At the place I’m working currently there are three female faculty, all of whom are visiting from the United States. (The toilets I used are designated women and handicapped, the other choice is men, interesting categorisation–but one that is less surprising when you learn that it wasn’t until 1966 that women were able to open a bank account or take a job without their husband’s permission). I can’t generalise, but my own experiences are that in the United States, I’m far less on my own. On the career front, the U.S. has given me some amazing opportunities. Because I work in the field of Computer Science, the opportunity to work at Bell Labs (the place where the transistor was invented, also Unix, among other things) was a time where I could connect to that history and be inspired by that degree of innovation and commitment to Science. More generally, Bell Labs was a national institution. It is revered by many in the sciences, I just recently heard a very senior administrator describe it favourably, and I am not surprised. Its walls were the history of the sciences, the people there were names in their scientific fields, and it was an environment that was inspiring and humbling all in one go. Then I left, the writing was on the wall. Those days were over. So, next stop Xerox PARC. Another place whose very being framed some of the experiences of Computing that we have today. In Silicon Valley, an opportunity to be near, surrounded by, the people who were going to give us many of the next experiences (like Google for example). Again it was an opportunity to live Computer Science. And I thank the United States for that. The National Park Service is also worthy of a mention. The U.S., particularly the West, is beautiful. It’s a set of incredible landscapes, many of which the increasingly put upon, National Park Service has tried to do to the best of its ability. I enjoy being in the spaces and places that they preserve. I enjoy the interpretation, it’s thoughtful and detailed. (I think that if the NPS did political discussions it would be amazingly good, grounded in relevant history, nuanced and refined, and presented clearly and thoughtfully… ). And then of course there’s the people. I like the optimism and enthusiasm that many Americans have. I enjoy the spirit of can do, will do. It’s encouraging. I like the curiousity. I’ve been a foreigner there, and that’s been an experience marked for me by the number of people who want to know more about where I come from and are not afraid to ask. (perhaps its not fear, but rather a sense that one shouldn’t ask, but I like the fact that asking is OK, it is permissible). I like the friendlyness here, despite being without US based family for a long time, I always had invitations for thanksgiving and christmas. I like that people want to invite strangers into their homes, thank you everyone! And most of all there are my US friends. Thank you all. I should begin by saying that this is fairly political. And that’s in a way the point, it’s all about having my voice back, at least for now. So, writing in France I should explain that this is a post that’s a reflection on citizenship and participation in democracy. And I’ve been frustrated for a long time about these issues (on a number of dimensions). Perhaps the first thing to say since arriving in France is that in many ways I feel like I am visitor. Most especially because my French is not good enough to be anything but an etranger (foreigner) in all situations. And yet, at the same time visiting here comes with some really awesome privileges. I’m able to work here without any papers… and I’m even able to vote (in European Union elections, and local elections for things like the Mayor — which matter more here since the Mayor has some clout). Admittedly perhaps French national elections are more exciting to vote in, but you know what, I’ve lived in the United States for 19 years, and they’ve never allowed me to participate in any aspect of their democracy. So, I’ve rediscovered my voice, one I’d learnt to forget I had (more on that in a minute), and now I’m actually a bit resentful towards the United States about the situation I find myself in there, and that’s more so when I find myself somewhere so very foreign, and in which so quickly I’ve had more opportunities to participate in democracy than ever given me in a place I’ve spent the majority of my adult life. I arrived in France departing from a situation where a number of people suggested, kindly, that I would find coming to Europe an opportunity to “get away.” And I think “getting away” is a visiting experience. But, I’m really convinced that it’s not one that I’m having. Coming here was about a “coming to” experience, not a “getting away from” experience. What I mean is that Europe is not a place I get away from, it’s actually a place where because I’m a national I have more rights, more obligations here… I guess I should have expected that. And I like it. It makes me feel like I belong, and that I do matter. It’s the type of experience I would like to have in the U.S. if that’s not clear to the reader by now (FYI: stunningly, I’ve only just become even eligible to naturalize because of the U.S.’s immigration system). I said that I try to forget about the frustration that my continued outsider status brings me. I’ll explain. The first few years were fine, I could experience the differences and accept my “outsider” status. But about a decade in, I was starting to feel fed up with not being able to (or having any clear-to-me path to being able to, I refer the reader to the above link which I think describes the situation well, for the curious I’ve held B, F, H, and the series of visas you have to when all else expires and the greencard has not arrived, and now the greencard) be able to participate democracy. I wonder whether this is particularly amplified by living in the United States, a country that takes a very public and articulated pride in individual’s rights, in democracy. It’s all very nice, but as someone who is taxed without representation, it gets a bit irritating after about a decade. So I decided that I would trade that frustration and anger for a good job (and other things I like about the U.S. Note: I was not married at the time I decided that I had to make this decision)… but being back in Europe I have thought more about what I did trade in… entirely of my making, my choice, but here it’s more difficult to take than I’m usually willing to admit. I’m delighted to say that at least a few French people have also given me hope that at least some people recognize that while I am English I am also an etranger there too. Most recently this happened in the local Epicerie. I had gone to break a 50 Euro note, which I decided to do with a purchase of a nice Lussac St. Emillion. When he asked me if I wanted a bag or whether I would put it in my handbag. I responded that I would be fine taking it in my bag, he responded to me in German. I closed the conversation, with the appropriate number of goodbyes in German. I liked very much that experience of being multi-lingual, if somewhat briefly. So, I guess I’ve enjoyed being back in Europe. I’ve enjoyed the feeling of belonging to something, to something I can actually participate in, and being in a place where people read me for what I am with far greater accuracy than usual. Not quite sure whether that’s how it’s spelt, and I suppose there’s some plural singular issues going on, but y’all get the drift. Metz is the short-hand for I’m going to be leaving the United States for over 3 months to teach classes at Georgia Tech’s Lorraine campus, located on the outskirts of Metz (although Metz is small enough that you could probably describe it as a campus located in a field outside of town). Metz is in eastern France, in the Lorraine area, close to Alsace and the borders of Germany and Luxembourg. It is also close to two TGV lines. And I am now preparing to leave. This means that I’m having some cultural encounters. So what do I learn about France. They care about their language and their culture. The test of language. The desire to extract a commitment to learn the language. They care about their culture. The 10 hours of cultural films are a hint here. I hope they’ll let me go, even though I don’t need to see them (I don’t need the certificate that says I sat through them, but I want one–consider it taking one for the spirit of improved Anglo-French relations). But it’s not all about immigration even though it is about a temporary emigration. I also notice that the pacing and rhythms are different. There’s a part of me that thinks wow–35 hour work week, about 8 weeks of vacation minimum, what a civilized society. And there’s a truth in that. But, I’m also used to a place where the shops are open 24/7, where the sales are not an annual event but a weekly affair, where Sunday is not different from Friday or Saturday. And I am sure that I am used to that. And I am sure that I am going to spend some period of time adjusting to the new planning. I can’t go out and get something just because I need it. I have to plan. And 35 hour work weeks are going to mean that people are not around as much as I expect them to be (not because I demand it, but because I’m just not used to a 35 hour work week). People ask me if I’m prepared. Truthfully you can’t prepare. That’s the upside and downside of emigration. You can’t prepare because you simply don’t know enough. It’s a leap of faith. That leads to incredible highs and lows. The smallest successes lead to feels of incredible accomplishment. The frustrations are beyond the worst at home because they don’t make sense. But if there’s one thing I’ve learnt about immigration it is that you have to ask for help. You have to be unafraid of asking people for all sorts of support that perhaps at home would put you into reciprocal relationships with high return obligations. But there’s no other way. So I’d like to close by thanking Val, Rob, and Ian who have already helped me more than I can ever return.